appetizers, chili and cream cheese dip, chili dip, cooking, food, Whatever Happened to Dinner? If last week’s recipe took half a day to make, this one took no more than half a shake. For real. Furthermore, I was floored when my husband came home from work one day recently saying “I have a new recipe you’ve got to try.” Husband? Bearing a new recipe? 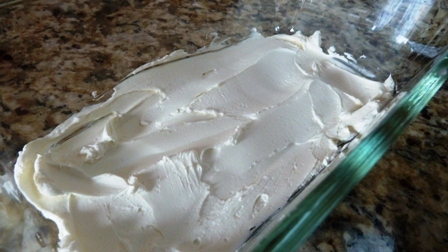 Spread softened cream cheese in bottom of 9 inch pie pan (use knife or spatula). Spread chili on top of cream cheese. 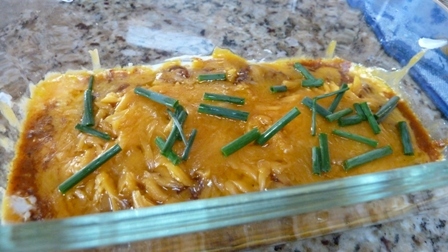 Cover with shredded sharp or cheddar cheese (or any mix of cheese you like). Microwave on high for 45-60 seconds, watching to see when cheese melts and mixture seems hot in center. The recipe I was given did not call for chives but they make a nice addition. You might also add halved cherry tomatoes, black olives, green olives, chopped hot peppers, chopped basil—if you use these things you know what to try. 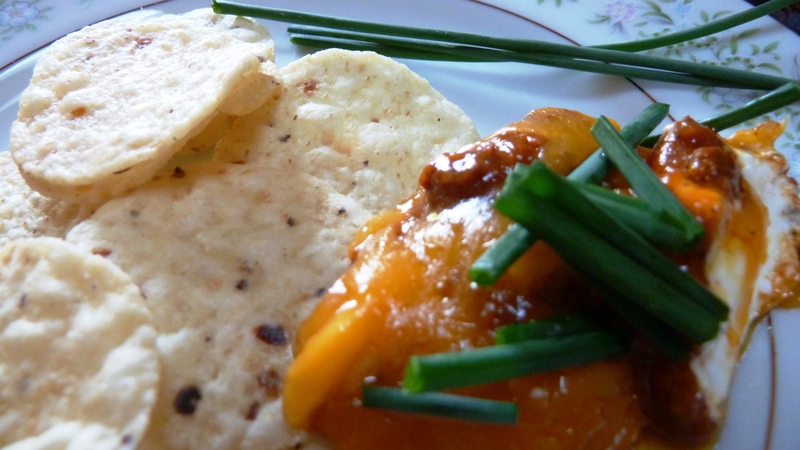 You could also easily substitute your own thickened chili, or use refried beans. Cautions: There are no preservatives in Hormel chili, but the sodium content is pretty high. Surprise surprise. Do you order appetizers in restaurants? While I don’t have a lot of use for them (usually get too full anyway with calorie-laden food) sometimes they make a meal in themselves. Does your spouse bring home recipes or suggestions to try? Do you welcome them? Why or why not? 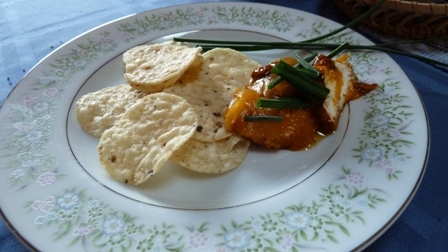 There’s a chapter with appetizers and party foods in my book, Whatever Happened to Dinner: Recipes and Reflections for Family Mealtime. I’m more than a “half and shake” than “half a day” type of cook. No, we don’t order appetizers, usually because they might interfere with our enjoyment of the main meal. Besides, they cost more and we are frugal. Thursday and Friday we had the Beaman boys with us as their teacher/parents spent time in the classroom during pre-planning week. Curtis announced he wanted to help me cook. Spaghetti sauce was on the menu and he learned how to curl his fingers so he wouldn’t damage them chopping onions. (Photo on FB if you care to check.) Then Friday he asked to cook again. I wasn’t planning to fix the pork roast until today, but he was so keen on helping I got out salt, pepper, cloves, onions, and soy sauce to make the seasoning for the slow-cooker. Somehow I was out of fresh garlic, so we improvised with garlic salt, not the same, but a reasonable stand-in. Like my own mother, Curtis’ mother Sarah likes to cook, and she didn’t realize how interested he was. You ask for a “spouse” tale and I have one ready, Melodie. Last Tuesday Cliff brought home six “2 for 1 cups” of Wendy’s chili + multiple cans of diced tomato sauce and kidney beans from the grocery store to stretch it out. He goes a little overboard on the quantity but I resist making a fuss; I need all the help I can get managing housekeeping with my writing life. In answer to your question: Yes, I do welcome his help with cooking along with the clean-up he invariably helps with. Lucky me! Marian, I spent one evening this week interviewing a 12 year old girl and watching her cook in her home–where she cooks almost every evening. Her parents also were off preparing for going back to school as teachers/coaches. I am so excited to share her enthusiasm & kitchen knowledge in upcoming posts. I love that you keyed into your grandson’s keen interest –this girl too learned much from her grandmother. Hope the pork roast turned out well! I also love your Cliff story–what a great idea to take advantage of a coupon special or whatever, the 2 for 1 and take it home and add in! What a dear. I never thought of that. He’s wise to help you stick to your, er, knitting! I don’t know if I have had a dip like that. We don’t often eat out (in restaurants) as we prefer our own food. I do make appetizers when we have a big meal like Easter or Thanksgiving or birthday etc. Usually a relish tray with dip or taco dip (a layered cream cheese concoction, but cold) and tortilla chips. Deviled eggs are another choice, and is favorite of my oldest girl. Her birthday is coming up so I am keeping that in mind and have two dozen eggs set aside. I want the older ones as they peel easier, especially since we get our eggs from the farm or my son’s chickens. No I can’t say my husband finds recipes for me. He’ll ask for certain dishes every now and then. I am looking forward to the story about your 12 year old cook. Recipe above is somewhat like a cold taco dip I have and enjoy too. Deviled eggs as an appetizer is an interesting twist! Yes, I believe in using older eggs when you want to peel them as well. And I now have 3 posts planned on this 12 year old cook, just waiting for her mother and her to approve them! Thanks for commenting! « Cooking with Lizzy: How many 12-year-olds cook dinner every night?